New York: A city that inspires. A city that draws people in. A city where everyone is watching, waiting to see what will happen next. 1967. Robert Mapplethorpe knows he is an artist. From his childhood home in Queens he yearns for the heat and excitement of the city, the press of other people's bodies. He wants to be watched, he wants to be known. 1891. Walt Whitman has already found fame, and has settled into his own sort of old age. Still childlike, still passionate, he travels with his friend and biographer Bucke to the city he has always adored, the scene of his greatest triumphs and rejections. 1922. Robert Moses is a man with a vision. Standing on the edge of Long Island he knows what it could become. Walking down a street in Brooklyn he sees its future. He is the man who will build modern New York. 2013. Edmund White is back in New York. It's the city of his youth, of his life and loves. He remembers days of lazy pleasure, nights of ecstasy and euphoria. But years have gone by since then. 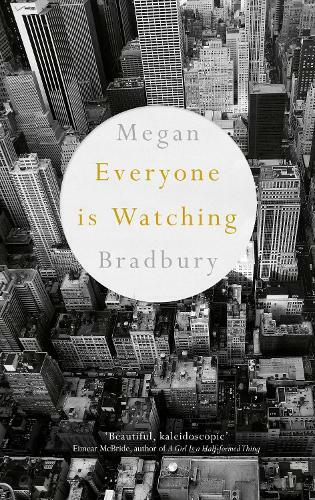 Everyone is Watching is a novel about the men and women who have defined New York. Through the lives and perspectives of these great creators, artists and thinkers, and through other iconic works of art that capture its essence, New York itself solidifies. Complex, rich, sordid, tantalizing, it is constantly changing and evolving. Both intimate and epic in its sweep, Everyone is Watching is a love letter to New York and its people - past, present and future. I've met the author of this book in Picador event when she was reading a passage from it. Her quiet reading voice and almost poem like prose intrigued me enough to make me read this book.